This is my 26th installment of Babywearing Stories 365. Each installment features a babywearer in 1 photograph and their answers to 5 questions. My goal is to normalize, promote and celebrate daily Babywearing, moving beyond *what* we use to carry our babies and shifting focus back on *why* and *where* we carry. I hope to share the stories of moms, dads, and babywearing caregivers all over the world. Enjoy! 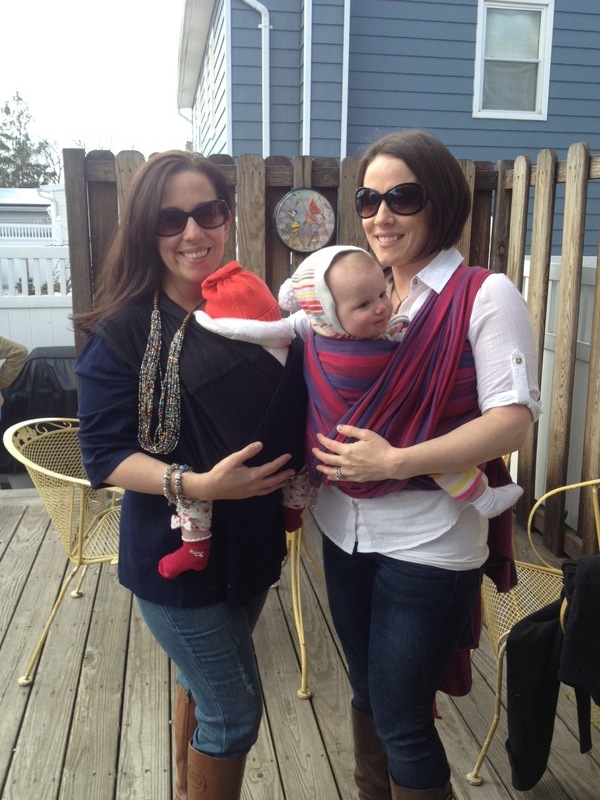 This photo is of me (Lizzy) wearing my 7 month old daughter Eleanor, and my sister Jessica wearing her 4 month old daughter Juliana. We were surrounded by lots of family; our mom, husbands, my sister’s son (my nephew), cousins, and aunts. We were in the backyard at my cousin’s son’s forth birthday party down at the Jersey shore!